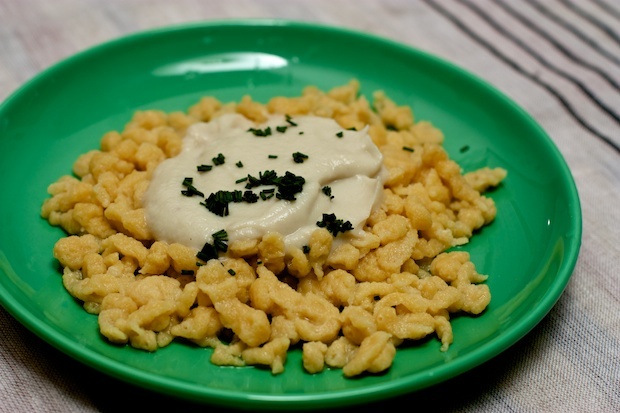 The first time I tasted spaetzle was during a trip to Austria. These dumplings were served as an accompaniment to a dish of pieces of meat with paprika. They were so soft and good that when I return home I immediately tried to create the recipe. Over the years I have tried many variations. The dish that I propose involves dressing them with a cauliflower cream. It is a way to eat veggies and use a low amount of fat. Today you can find spaetzle in the supermarket, they are the green version (with spinach) in transparent packaging in the refrigerated section. If you try this recipe you will find that it is very easy to make but to facilitate the operation there is a little tool that looks like a cheese grater and which is found in cooking stores. Cut the cauliflower into small pieces, remove the inner core. Place the shallot that has been cut into 4 pieces with milk and a little salt in a saucepan. Cook over low heat in a covered pot. When the florets are very soft (about 40 minutes ), turn off the heat. With a slotted spoon take the cauliflower florets pour them into a blender with cheese. Blend until you it turns into a soft cream. Cool the remaining milk in the pan. In a bowl add the flour, eggs and a little salt, stir with a wooden spoon, adding a little sauce from the cooked cauliflower. It will make about a glass. Beat the mixture very well, it should be soft and elastic. Stir until the dough forms bubbles. Cover with plastic wrap and let stand at least 1 hour. You can also prepare this in the morning to cook it in the evening. Prepare a bowl with cold water to keep close to stove top. Bring a pot of water and salt to a boil. Put in a saucepan on the heat with the cream of cabbage. When the water boils, pour in the mixture into the special tool for spaetzle and drop the dumplings into the water. When they rise to the surface, collect them with a slotted spoon to cand put them in the bowl with cold water. When all are cooked, drain the water. Keep the water boiling in the po . Bring it to a boil and pour the amount of dumplings that you want to serve. When you are ready to go back to the surface drain. The others can also keep in the fridge for the next day. Place into individual dishes topped with one or two tablespoons of cream of cabbage, top with the chives and serve hot.